It’s clear why you might want to avoid court involvement in your estate for financial reasons, knowing that probate can quickly get costly and time consuming for those involved. But there is an emotional component to it as well. Your assets are just that: yours. And the idea of them being discussed and deliberated on in a public forum might not be such an appealing one. When someone experiences mental incapacity, documents in their estate plan can direct a trusted person to carry out that individual’s wishes for the situation. But what if no such documents have been drafted? Then their business becomes the government’s business, too. A court proceeding called guardianship or conservatorship (also known as “living probate”) will be held to appoint guardians and conservators to manage the affairs of the incapacitated person. When an estate goes through probate, the court oversees the gathering of the probate assets, payment of any outstanding debts, determining whether a will is valid, and who the deceased’s heirs are. The proceedings ultimately determine who should receive the assets that are left after payment of debts, taxes, and costs. In order to avoid guardianship, conservatorship, and probate, you can work with us to keep your affairs out of court entirely. Agents or attorneys-in-fact are the individuals or entities you appoint to make decisions for you, be they medical or financial. You designate agents or attorneys-in-fact in a document known as a power of attorney. Durable powers of attorney are documents that continue in validity after the incapacity of the maker of the document (i.e. “durable” against incapacity). Since a durable power of attorney continues in validity, a durable power of attorney can help bypass the need for court-appointed guardianship or conservatorship. Trusts are agreements that hold some or all of your assets, and trustees can be either individuals or corporate entities. 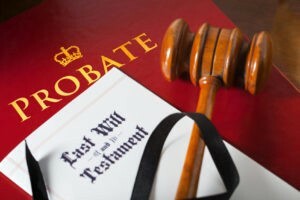 Unlike wills, trusts do not go through probate. There are several types of trusts, and we can help you decide exactly which kind is best suited to your estate. By setting up and completely funding a revocable living trust, you can accomplish two important things. First, you can rest assured that your assets will be distributed to your chosen beneficiaries and won’t go through probate upon your death. Second, you also retain the ability to change or cancel the arrangement during your lifetime enabling you to adjust your plan as your financial or family circumstances change. Deciding on appropriate powers of attorney and drafting revocable living trusts are just two of the many steps we can take together to keep your affairs free from court involvement. With a solid estate plan put into place with the help of a trusted attorney, you can take comfort knowing that everything you’ve worked so hard to build and maintain will be passed along to only the people who matter most. Give us a call today (913) 871-2188 to learn more about interference-proofing your estate plan.